Can Dux-Soup capture the emails? Dux Soup is able to capture the email addresses only for 1st-degree Linkedin connections. If you want to capture the emails for your 2nd and 3rd-degree connections, you will have to purchase Dux-Soup Points. To purchase Dux-Soup Points, click on the Dux-Soup icon in your browser and go to Dux-Store. Once you enter the Dux-Store, you will find the information about our packages and rates. One Dux-Soup point equals one successful email found. This means that if Dux-Soup is not able to find a profile’s email, or if a lookup isn’t required, a point will not be deducted from your account. It’s important to note that if you accidentally delete the captured Dux-Soup profile data from your browser, you can still visit the same profiles and get their emails 7 days after the initial lookup and you won’t be charged an additional point. 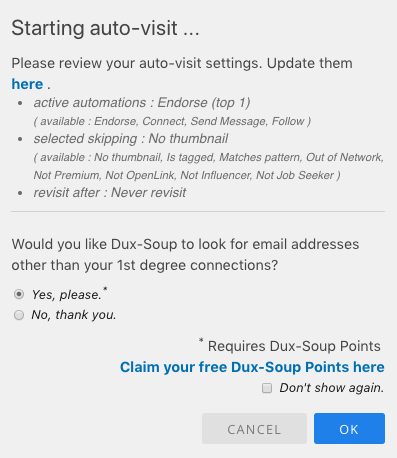 After you purchase the points, make sure you enable "The Address Finder" in the Dux-Store and when you run Dux-Soup by clicking on "Visit Profiles", you will see a grey pop up where you need to choose "Yes, please", so that the emails of your 2nd and 3rd degree connections are also captured.